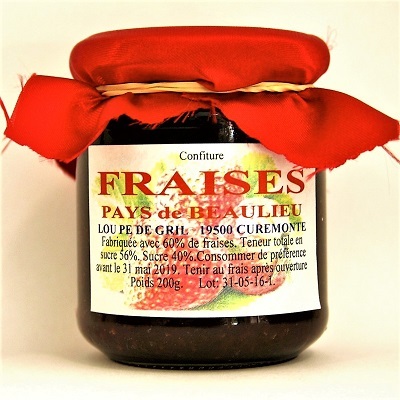 A delightful French food gift Hamper from the Correze region! This month, La Gourmet Box invites you to discover one of those special places that seem made for foodies, a region rich in culinary diversity and skilled artisans: Corrèze, land of presidents (two of France’s last four leaders hail from this region) but, above all, realm of gourmet delights. Nestled between fertile valleys to the south and the foothills of the Massif Central, Corrèze is a crossroads that tickles the taste buds. Southwest-style duck, Limousin meats (farm-raised beef, lamb or pork) with a mandatory dollop of “violet mustard” on the side, wild mushrooms, walnuts, chestnuts, strawberries... the list goes on and on. We expected to be pleasantly surprised, but we’re still amazed at how many gourmet discoveries we made! Corrèze is a land of truly exceptional cuisine, but don't take our word for it: tasting is believing, so dig into this gourmet hamper and judge for yourselves. Craft Brewery: Brasserie Corrézienne, Boris Chartier. Boris’s microbrewery in Curemonte, Corrèze, considered one of the most beautiful villages in France, is an excellent example of the renaissance of French craft breweries that began in the 2000s. We decided to kick off our tasting tour with his Special Bitter, an “oh-so-British” amber beer. 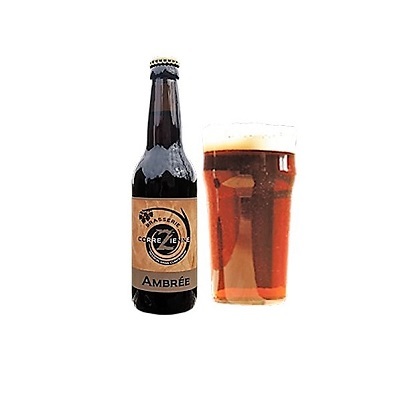 Notes of caramel and raisins, a hint of bitterness and the grassy aroma of hops make it a distinctive brew appreciated by bitter lovers. The perfect choice for an evening pint or to accompany the pork confit in your hamper—yes, the art of pairing can also be applied to beer! Serving temperature: 8–10ºC. For our next taste sensation, we chose La Floréal. 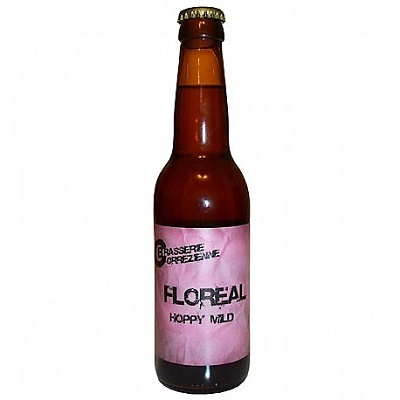 As its name indicates, this “flowery” craft beer has a bouquet reminiscent of fruit and spices, with sweet malty aromas and a subtle bitter hint that invites you to take another sip, making it the perfect companion for appetizers. Artisan: Distillerie Denoix, maître liquoriste. Violet mustard is a traditional speciality of Brive, and the Denoix distillery has revived and perpetuated it with time-honoured methods and expertise. 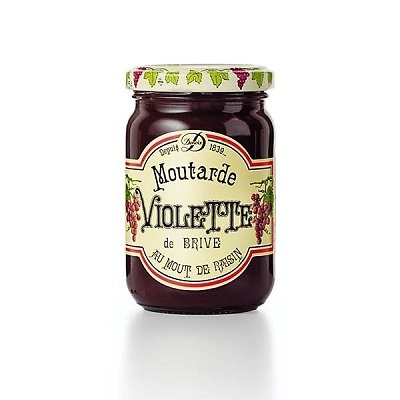 Instead of artificial colouring, grape must is used to give the condiment its distinctive purple hue. With its sweet yet spicy flavour and smooth texture, this gourmet mustard can enhance a wide variety of dishes. Once you’ve tried it, you probably won’t be able to go without—we certainly can't. Let us know you think! 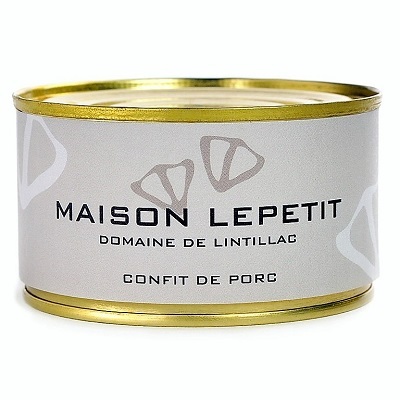 Artisan Cannery: Maison Lepetit Domaine de Lintillac. The Lepetit cannery occupies a historic location in Ussa, a village near Brive in the heart of Corrèze. Duck in all its forms is the most famous staple of the southwestern French cuisine in which Maison Lepetit specializes, but when we tried their pork confit, we knew we’d stumbled upon a rare and surprising example of culinary originality. Savoury, smooth and creamy but not fatty, it can be eaten cold—with its jelly on a fresh salad, for instance—or warm, pan-seared with golden potatoes... any way you serve it, it’s an eye-opening gourmet discovery! And if you want a truly amazing experience, try it with a bit of violet mustard. Artisan: Le Médaillon Corrézien, Exploitation fermière d'André Ourcet et Catherine Le Clanche. 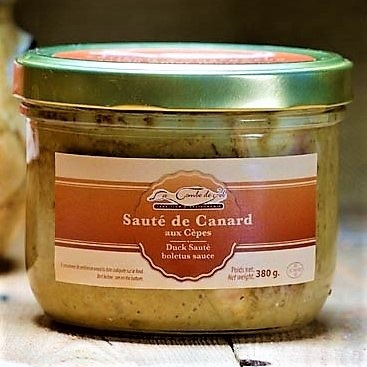 Pulled duck (effilé de canard) is meat taken exclusively from the duck’s neck. Intensely flavourful and very lean, this meat is cooked for hours with no added fat to obtain a highly nutritious food product. And in this recipe, the citrus “disguise” really brings out its amazing taste and texture. Craft Cannery: La Combe de Job, Catherine et Fabrice Gobert. The talented people who run this family farm in Corrèze have made a success of turning their own products into exquisite traditional dishes. True to local culinary tradition, La Combe de Job has created this tasty dish redolent of shady forest floors by combining succulent porcini mushrooms with duck, the king of southwestern French cuisine. Warm over low heat and serve. 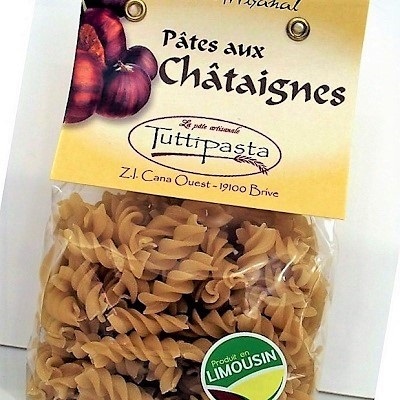 Artisan pasta maker: Tuttipasta, François Bua. What do you get when a Corrézien of Italian heritage combines his family recipes with his love of local products and adds a gourmet twist? Tasty artisanal pasta, of course, made with typical Corrèze delicacies: porcini mushrooms, chestnuts, walnuts and truffles. He doesn’t rush the kneading, setting and drying processes, which makes his handmade pasta superbly nutritious and delicious. We chose his delectable chestnut fusilli, with a texture you can’t find in store-bought varieties; something this exquisite only comes from hand-rolled dough. We tried it with the duck sauté, and the combination is out of this world! 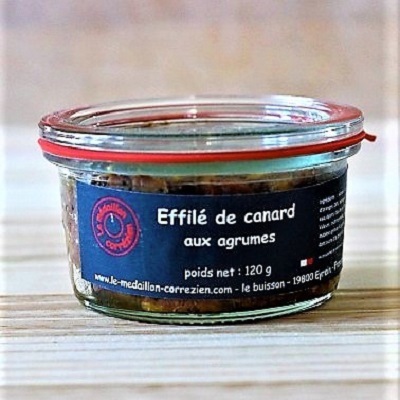 Artisan: Limouzi Saveurs, Cyril et Sophie Chabenat. After a stellar career as a pastry chef, working with some of the biggest names in the food business (head pastry chef at Michel Troigros, no less! ), Cyril returned to his native Corrèze. Together, he and Sophie decided to create a honey cake worthy of the name, something that captured the delicate, generous nature of Limousin. 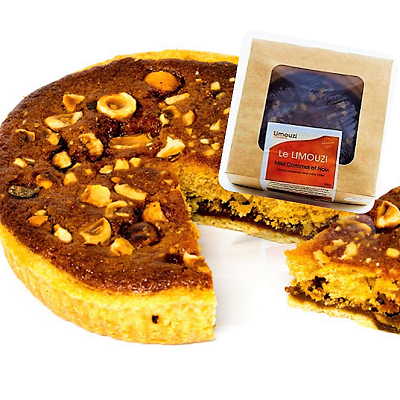 And so the Limouzi was born, a sweet honey and walnut cake with a hint of spices and citrus fruit. With its premium locally-sourced ingredients and the chef’s signature flair, this delicious cake is sure to win over even the most fastidious epicures. Artisan: Ferme Lou Pe de Gril, Maurice et Francine Guionie. For over 16 years, Maurice and Francine have grown and processed their own natural, sulphate-free farm products. And their strawberry jam, made with no artificial colourings, additives or preservatives, is a huge success. As any seasoned jam-maker knows, creating a good strawberry jam is not precisely easy, and this particular one is a genuine work of art. Lovely colour, good consistency and a unique taste not overwhelmed by too much sugar—we’re in love! After the second spoonful, we guarantee you’ll never want to buy another supermarket jam. 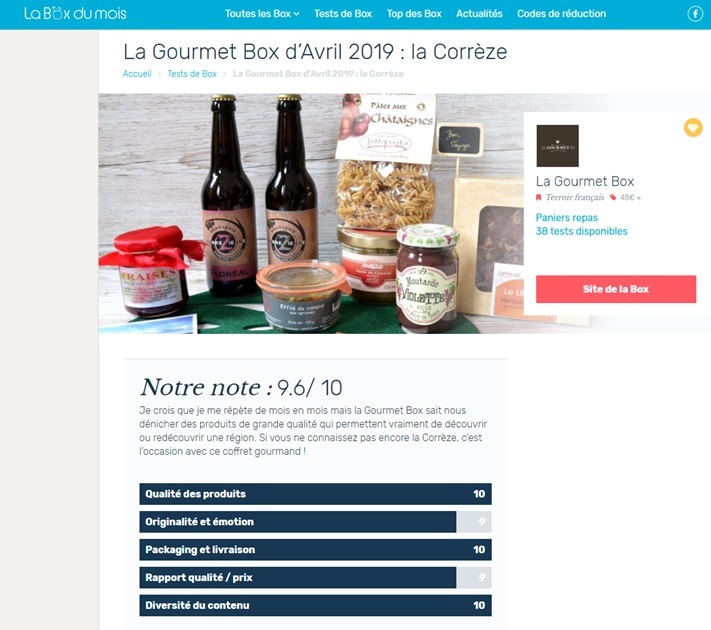 This month, our French gourmet box of Correze in La Box du Mois website: excellent rating !